The first decision to make when buying or designing an industrial work platform is the type of metal you want for the structure. You typically have two options: aluminum or steel. There are benefits to both, but for many applications, aluminum is a much preferable option. There are three key reasons for this: weight, profile availability, and corrosion resistance. At roughly 1/3 the weight of steel, aluminum has a large advantage when it comes to setting up, moving, positioning, and even shipping a work platform. It rarely takes more than two people to move an aluminum work platform, and positioning can be performed by virtually anyone, not just the largest and strongest members of your organization. Yet aluminum has a higher strength-to-weight ratio than most other metals, and it is more than strong enough for most work platform applications. The second factor is the availability of extruded profiles that aluminum offers. Aluminum can be ribbed for structural strength or traction, or extruded to provide unique shapes and features. It offers many more options than milled steel. These extrusions are used to significantly enhance the design and usability of a work stand. The third factor, corrosion resistance, is also critical in many applications. Untreated aluminum has the fascinating characteristic of spontaneously forming an oxide layer on its surface to prevent further oxidation. Even when damaged, the aluminum oxide layer repairs itself immediately. This means there is almost no risk of corrosion, which would put the structural integrity of the platform severely at risk. Steel in an uncoated state is prone to oxidation and degradation, resulting in a limited lifespan and potentially dangerous corrosion situations. Coating with paint or polymer powders improves the properties but still has the potential for under-coating rusting and area rusting where scratches or surface damage occurs. Galvanic coatings must be performed post-fabrication and add considerable expense to the product, while providing no protection in areas that are modified post-coating, such as holes that are drilled in-field. As aluminum is a corrosion-resistant base metal, it retains its properties even in these post-processed areas. So why wouldn’t you want to choose aluminum? The most common reason is price; aluminum is more expensive than steel. However, this cost may be offset by the use of aluminum extrusions. Rather than spending money on cost-intensive fabrication processes required to achieve the desired steel profiles, aluminum stock can be purchased in the exact shape required. The second concern about aluminum is deflection. It is true that aluminum can, in some applications, exhibit more deflection than similar sized steel. However, with proper structural design it is seldom an issue for work platforms. The final issue to be aware of is that aluminum is more difficult to weld than steel because of the aluminum oxide layer. 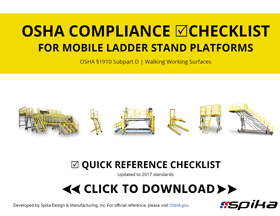 It is critical that your work platform manufacturer welds according to AWS D1.2 or another established welding code to ensure your platform welds are reliable and of the highest quality. All things considered, aluminum often proves to be the material of choice for most work platform applications.